What is an Anterior Dislocation? 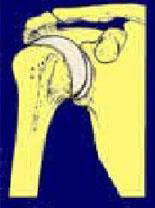 The shoulder is an unstable joint because of the limited bony contact. 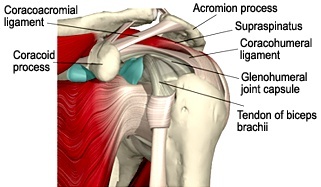 The shoulder therefore relies heavily on muscles and ligaments to hold the joint together. Most dislocations (≈90%) will dislocate anteriorly i.e. the humeral head will pop out the front. The arm is typically out to the side when this happens, with the hand raised above the head. It can happen because of trauma which pushes the hand backwards, or an external force which pushes the shoulder forward. 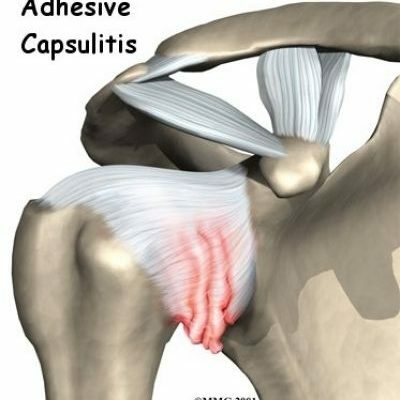 Adhesive Capsulitis (also known as “Frozen Shoulder”) is a condition which is characterised by severe pain and loss of motion of the shoulder joint. It is more common in women, in those in their 6th decade, and can be associated with diabetes and duputryn’s contractures. The natural history is a 2 year course which is defined by 3 distinct phases. Phase 1 (‘Freezing) is typified by pain and progressive loss of movement and lasts from six weeks to nine months. Phase 2 (“Frozen”) presents with more loss of movement than pain and can last from seven weeks to nine months. Phase 3 (“Thawing”) involves the gradual resolution of range of movement and involves very little pain. Treatment options include early cortico-steroid injection (within the first 3 months of Phase 1). Physiotherapy may include gentle range of motion stretches in this phase. Treatment in Phase 2 and 3 may be more directed towards mobilisations and a continuation of stretches. Care should be taken not to increase pain during the treatment. When your shoulder dislocates with your arm out in front of you or out to the side, strain is placed upon the capsule or the labrum (the cartilage which deepens the shoulder socket) at the front of the shoulder. Too much strain on this capsule / labrum will cause a tear. 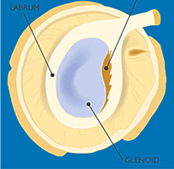 This tear is called a Bankart lesion and may affect either the capsule or the labrum. A large percentage of people (≈90%) who dislocate their shoulders will either damage the labrum of the shoulder capsule. Patients who are younger tend to tear in the labrum, while older patients (over the age of 40 years) tend to tear the capsule or muscles. 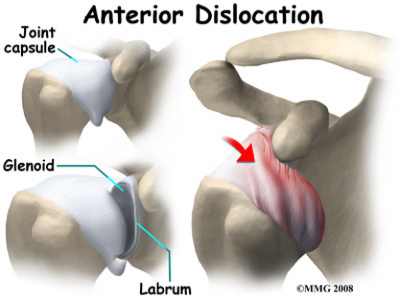 The damage to the labrum may be one reason that younger people tend to have more recurrent dislocations than older people. The presence of a Bankart lesion affects the stability of your shoulder and may alter the centre of rotation of your humerus. This can cause pain or instability. What is a Bony Benkart lesion? 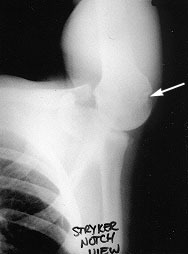 Bony Bankart lesions occur during a shoulder dislocation. 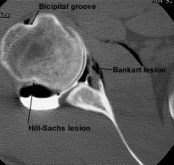 Whereas other Bankart lesions involve the capsule or labrum (cartilage which deepens the shoudler socket), a bony bankart lesion, typically involves a chip of bone being removed from the anterior-inferior part of the shoulder socket (glenoid). 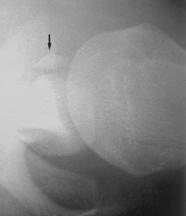 These fractures can vary in size, and treatment of the bony bankart lesion is dependent upon how big the chip of bone is. A Frozen shoulder (sometimes called ‘Adhesive Capsulitis’) is a term for a shoulder that has decreased movement because of stiffness and changes in the structure of the joint capsule. It can occur without any trauma (primary) or following injury (secondary). It is more common in women than men, and most common in people in their 6th decade. There also appears to be some links with dupuytren contractures and diabetes. There appears to be no relationship with hand dominance. A frozen shoulder typically has four phases. 3. In the third phase the pain in the shoulder starts to decrease, but there still remains considerable limitation in the range of movement in your arm. A full resolution typically takes between 12 and 24 months and while people commonly regain all their function, sometimes limitations in the shoulder range of movement remains. What is Hill Sach's lesion ? A Hill Sach’s lesion is a dent in your humeral head. This occurs during a dislocation beccause the bone in the humeral head (the ball) is softer than the hard bone of the glenoid (the socket). In an anterior dislocation, the humeral slides forward and the soft bone of the back of the shoulder butts against the hard bone of the front of the glenoid, causing an indentation in the bone. When a posterior dislocation / subluxation occurs, the humeral head slides posteriorly and the front of the humeral head butts against the posterior part of the glenoid. This causes an indentation in the front of the humeral head which is called a reverse Hill Sach’s lesion. How should I strengthen my shoulder? eople with anterior instability typically feel nervous with their arm stretched out to the side, or above the head. They may also feel pain in the front of the shoudler in these positions. Bankart lesions, Hill Sach Lesions commonly occur in an anterior dislocation. Subluxations can also occur in an anterior direction. Should I wear a shoulder brace during contact sport? Should I wear a shoulder brace during contact sport? Should I wear a shoulder brace during contact sport? Should I wear a shoulder brace during contact sport? Should I wear a shoulder brace during contact sport? The research is based upon the fact that anterior shoulder dislocations commonly occur in a position where your arm is outstretched with your hand rotated upwards. 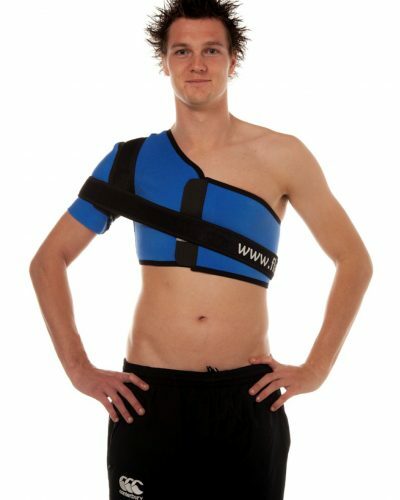 In this position the capsule at the front of your shoulder is exposed. The brace acts to limits the amount of movement that your arm can move, and therefore decreases the risk of you suffering from another dislocation. It is also proposed that the brace helps to increase the proprioception around the joint by increasing the compression on the skin receptors and thus make up for the fact that receptors in the ligaments and muscles might be damaged from the injury. Research into this is continuing. What is an posterior dislocation? Some dislocatiosn occur posteriorly i.e. the humeral head will pop out the back. The arm is typically in front o fthe body and forced backwards, or force across the body (like if you were trying to hug yourself). In people who have increaed laxity in their shoulders, the shoulder can dislocate posteriorly with minor trauma such os pushing open a heavy door, or doing press-ups or CPR. Are push-ups good for my shoulder? Push-ups are typically used to strength Pectoralis Major, the large chest muscle that lies across the front of your chest. Research into the use in increased strength of this muscle remains variable. Some propose that increased strength of Pectoralis Major draws the humeral head forward and increases the instability of the shoulder. Other people propose that any strength around the shoulder is good for it, and will prescribe push-ups as part of the strengthening regime. Shoulder impingement refers to compression (or impingement) of tendons (and/or bursa) around the shoulder. There are three different classifications. biceps tendon can also be involved and irritated. Patients will present with anterior shoulder pain and are typically under the age of 35 years. Internal impingement is impingement at the posterior shoulder of the supraspinatus and infraspinatus tendon. This can occur when the humeral head slides forward and the elbow extends, the pinching the posterior structures. Patients present with posterior shoulder pain which is worse when reaching behind them. Scapular instability is a term that indicates that you have increased movement or decreased control of your scapular. The scapula relies heavily on muscel control as the only ligamentous fixation is via your acromioclavicular joint (ACJ) and your collar bone (clavicle). Thus scapular instability commonly occurs when the muscles around your scapula are not strong enough to hold onto the scapula bone. Increased movement in your scapula can result in pain in your shoulder joint. This is because the foundation on which the shoulder socket is placed is moving and therefore pinching of tendons or bursa around your shoulder can result. It is kind of like a house that is built on a sandy soil. 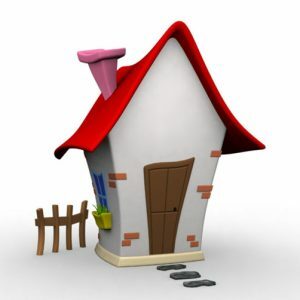 Because the foundations of the house are unstable and moving around, cracks and damage can appear in the walls and floors of the house. 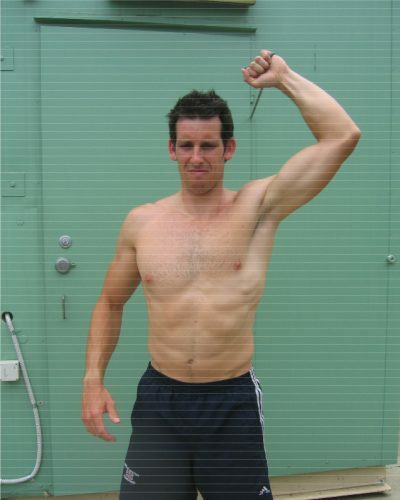 In a similar way, scapular instability can contribute to shoulder instability. Your therapist will commonly prescribe exercises to strengthen themuscles around your scapula. These exercises may include push-ups, prone holds, side holds, seated row to name a few. Check out some exercises for Serratus anterior on this website to give you a few new ideas. Shoulder proprioception refers to the ability of the muscles, ligament, skin and joint capsule to detect movement, force, or activity. Muscle receptors detect stretch on the muscle. Tendon receptors alsodetect the amount of pull on the tendon. Joint receptors detect the amount of stretch or compression on the capsule. Together these proprioceptors act to send information to the brain regarding the position, movement or level of activation in muscles around your shoulder. Without this information, you would not be able to tell the position of your shoulder, whether your muscles are working or if you are touching something. Proprioception can be decreased in longstanding shoulder injuries, and has been documented in cases of recurrent instability. Some people have proposed that decreased proprioception may result in an increased risk to injury, although there is little evidence to support this. 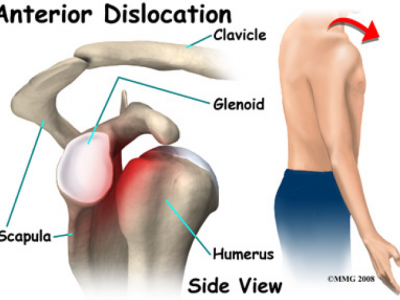 What is the difference between a shoulder dislocation and a subluxation? Your shoulder is held is place by ligaments and muscles. When your shoulder subluxes out of its socket, this is because the ligaments and muscles are lax or ruptured. When a subluxation occurs, the humeral head slips out of its socket, it slips back in with minimal movement of the arm. Symptoms include shoulder pain, a ‘dead arm’ or paraesthesia for a short moment in time. When a dislocation occurs the humeral head slips out of the socket, it does not relocate by itself. A shoulder dislocation requires relocating by external force, commonly performed in a hospital. Shoulder dislocations are typically very painful, and become increasingly painful if they are not relocated within a short space of time. The increased muscle spasm can make relocation difficult if the shoulder is not relocated by a health professional (as soon as is practicable). It is advised that a shoulder X-Ray is undertaken following a dislocation to make sure there is no fracture. Traumatic shoulder dislocations are very painful, and unfortunately for some patients there is a high rate of recurrence. Most research regarding the recurrence of shoulder dislocations has been undertaken in Scandinavia, and there is little research available on a New Zealand population. However, across all races and cultures, the resrach would suggest that repeated shoulder dislocation is more common in those people who have their first dislocation under the age of 20 years. There is some evidence that wearing a brace after a dislocation will reduce the risk of dislocation. 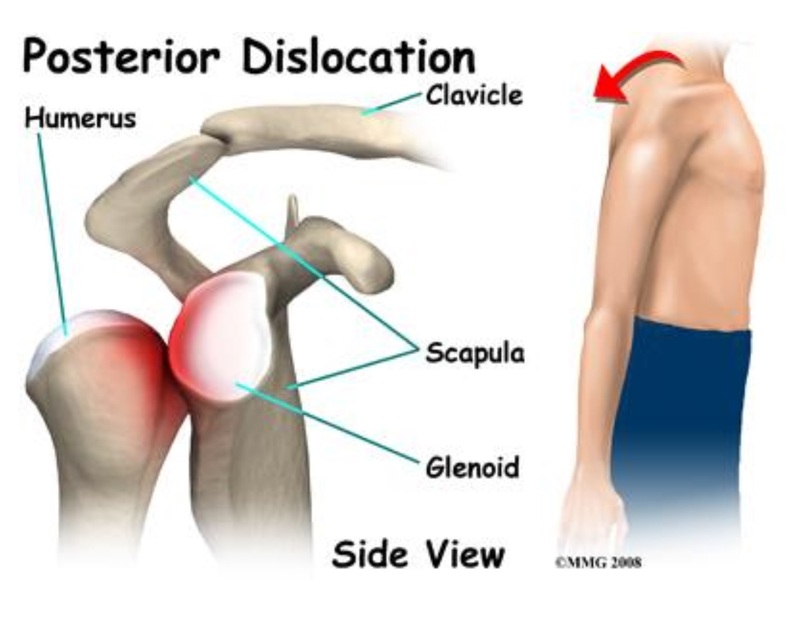 Around 95% of shoulder dislocations occur in an anterior direction. It is thought that this may be due to weakness in the ligamentous structures in your shoulder or because of the range that your shoulder is exposed to and the position when trauma occurs.